Hyundai is showcasing the 2018 Hyundai Santa Fe at the 2018 Geneva Motor Show. Here are its live images from the Swiss show. The SUV was officially unveiled on February 6, 2018 and went on sale in Hyundai's home market towards the end of last month. 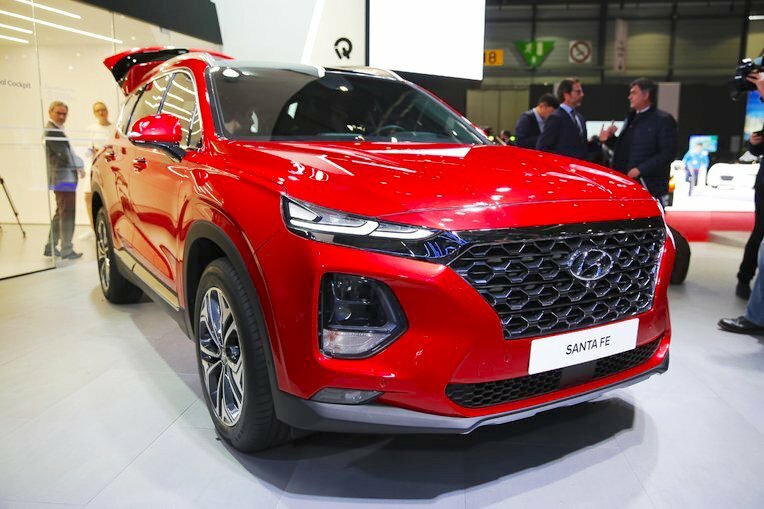 The Hyundai Santa Fe has now incorporated the new design language for SUVs that was introduced by the Hyundai Kona last year. 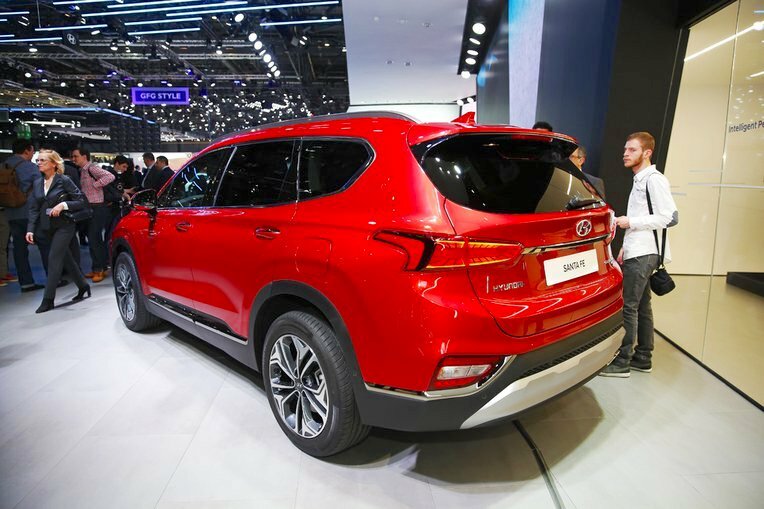 Moving to its fourth generation, the Hyundai Santa Fe has incorporated the new design language for SUVs that was introduced with the Hyundai Kona last year. The 2018 Hyundai Santa Fe measures 4,770 mm in length, 1,890 mm in width and 1,680 mm in height. It has a 2,765 mm wheelbase and a 185 mm ground clearance. The redesigned model is available in two versions: 5-seat and 7-seat. On the outside, the 2018 Hyundai Santa Fe features a large Cascading front grille, twin-headlamp setup with LED DRLs positioned on the top of the LED headlights, 19-inch alloy wheels, rear spoiler and LED rear combination lamps. Inside, Hyundai offers advanced features like 7-inch virtual instrument cluster, colour HUD, 8-inch touchscreen infotainment system with navigation, Apple CarPlay, Android Auto and Sound Hound music search, wireless charging for smartphones and Krell sound system. In addition to carried over features like six airbags and a 360-degree surround-view camera, the all-new Hyundai Santa Fe has several new active safety and driver assistance technologies. Two of them particularly worth noting are Safety Exit Assist (SEA) and Rear Occupant Alert (ROA). Safety Exit Assist (SEA) temporarily locks the doors when a passenger is trying to open the door on the side where a vehicle is approaching from behind and getting close, in order to avoid an accident. Rear Occupant Alert (ROA) monitors the rear seats to detect passengers and alerts the driver when leaving the car. Both these features are mainly aimed at increasing child safety. Hyundai has introduced the all-new Hyundai Santa Fe with five engines. 6-speed manual and 8-speed automatic are the transmission choices. The HTRAC AWD system is optional. The all-new Hyundai Santa Fe is already available in South Korea. More international markets, including those in Europe, will start receiving it later this year.